We are glad to see some push-back against SB-510 in the U. S. Senate, last week, but there needs to be much more, now. In the mean time, please continue to spread the word to other concerned Citizens and tell your two U.S. senators that you know this bill is about global, Marxofascist control over American food production, via the worldwide tyranny of Codex Alimentarius and Agenda 21 (for today, we will suggest you Web search those terms; come back to the Gulag for more, soon). 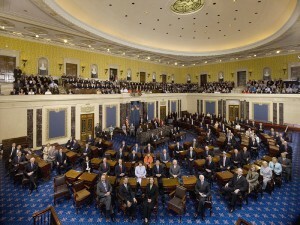 The Senate vote for passage is expected soon after Thanksgiving. Food safety legislation that came close to a vote in the Senate last week, before stalling over a political debate about earmarks, has another enemy: the Tea Party movement. The alert credits Sen. Tom Coburn (R-OK) with giving activists time to stop the bill. Coburn tried to force a Senate vote on an unrelated amendment to ban legislative earmarks through 2013, a move that punted a vote on the food safety bill until after Thanksgiving recess, at the earliest. Coburn has also expressed concern about the legislation, which moved forward in the Senate with 74 votes last week, for not systemically addressing the overlaps and gaps in the food safety system, and for the bill’s price tag of $1.4 billion over four years. “I come to you to apologize that I did not pay attention enough to this farm bill and get this research done fast enough, and last night I had our researchers working through the night and got a briefing about, what, 6:30 this morning on it and because last night cloture happened in the Senate,” said Beck, to his audience of millions. Thank you, Tom Coburn. Thank you, Glenn Beck. We were very honored to host last Thursday’s Gulag Night (available for listening) and hear from guest, Doreen Hannes, a key leader in the study of food and agriculture policy in America and the very malignant encroachment upon it by anti-American globalism. See Doreen’s treatments, at News with Views and her blog, Truth Farmer, along with longstanding champion of American sovereignties, Henry Lamb, here at the Gulag. And, back to the Thinker, you may also read further analysis of SB-510 at “First Health Care, Next the Food Supply,” by Michael Geer. We were also very privileged to hear from expert researchers and analysists of the global Marxist movement, Trevor Loudon and James Simpson. Their first topic of the night was George Soros and how he fits into the overall Marxofascist movement. A key element was Loudon’s and Simpson’s explanations of how the so hearalded “defeat of Communism,” circa 1990 was staged, frankly, in order to: 1. fool the free world into letting down their defenses and, 2. loosen their economies in ways allowing them to transfer more of the wealth of the free world, to them. “Them” here refers especially to Russia and China, but also the socialist/fascist dictatorship presently known as the European Union. Yes, and all their central banks and financiers, too, Toto, Jewish or not (who cares?). Significant corroborative details were expressed. We can see how important it is to understand and relate the art of war and deception involved in the breakup of the Soviet Union and the economic loosening of the People’s Republic of China, when we see the troglodyte-elite defense of George Soros, evident now in The New Yorker’s “Puppetry,” by Hendrick Hertzberg. He props up Soros by pointing out that his mega-manipulative ways actually took part in (and profited from, eh?) that 1990-era freeing of Eastern European Nations from Russia. What is funny here, at Mr. Herzberg’s expense, is that just as Soros collaborates with globalist Marxofascists now, he was actually collaborating with Russian Marxists at that very time. Oops. From the Food Safety News article cited above, perhaps Mr. Beck or those who work for him actually listened to our humble program. If so, that is to their credit. We humbly suggest you do so, too, as you iron your shirts (or take your notes). We intend that you soon may read more about what was discussed, but why not hear it, now?